Dundee vs Inverness CT predictions for Saturday’s Scottish Premiership clash. Dundee hope to drag themselves off the bottom of the Scottish Premiership. Read on for all our free predictions and betting tips. Dundee’s resurgence ended last weekend as Rangers beat them 1-0 to put an end to their two match winning streak in the Scottish Premiership. Despite the narrow margin of defeat against the huge favourites it will be a bitter pill to swallow after they held the Glasgow giants for 92 minutes before conceding the only goal of the game. The performance as a whole was very promising for a Dundee side who have found themselves glued to the bottom of the table for the majority of this season. They won their opening league game but then lost seven of their next ten outings before beating Hamilton and Motherwell recently. They remain bottom of the table, but with the table being so tight in that section a win on Saturday could send them as high as 6th. In terms of individual performances not many have been cutting the mustard at Dundee. Rory Loy is their top scorer with three league goals, but none of these have come on home turf. I wouldn’t feel confident recommending anyone from the Dundee side of things for our correct goalscorer predictions. Inverness CT, on the other hand, do have a star player to call upon. Striker Losana Doumbouya has netted five goals this season and has netted four of them in Inverness CT’s last five games. He’s an in form player coming up against a side with just three clean sheets in 14 matches this season, so backing him to score anytime at 2/1 looks a very good option. The other end of the pitch is where it could come undone for Inverness CT though. They have conceded three goals in each of their last three matches and hold the worst defensive record in the division at the moment with 27 goals conceded in 14 matches. This has resulted in just one of their last seven games ending in victory, but it has also resulted in some very entertaining matches, including a 3-3 draw at home to Hearts and last weekend’s 3-1 loss to Aberdeen. Nine of Inverness CT’s last 13 games have seen at least three goals scored, which is no surprise given their awful defending and relatively in form attackers. This makes odds of 1/1 for Over 2.5 Goals on Saturday look very appealing, and I’m backing that along with a 2-1 win for the visitors at 9/1 for my correct score predictions. 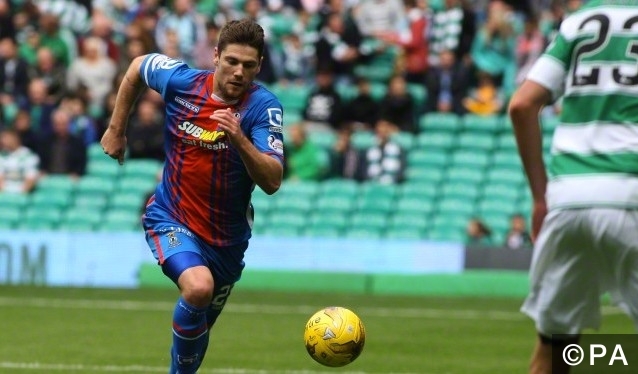 Inverness CT have won three and drawn three of their last six meetings with Dundee. Centre back James McPake and midfielder Mark O'Hara are still out with knee injuries. Right back Kevin McNaughton is out for another week or so with a knee injury. 69% of Inverness CT’s last 14 games have seen Over 2.5 Goals and there has been an average of four goals per game in their last four outings.